1. To allow us to process your booking. 3. To keep you up-to-date with our products and services if you subscribe to one of our mailing lists. We will never collect sensitive information about you without your consent. The personal information which we hold will be held securely in accordance with our internal security policy and the law. If you have any questions/comments about privacy, you should email us using the online contact form. No personal or payment details will be retained on a permanent basis. All order details submitted through this site are processed through and held on a secure server. All website content is held in a secure, password protected database, and accessed solely by authorised members of our staff. Cancellations made by the customer less than one month before the booked date of travel will not qualify for a refund. A £10 administrative charge will apply to all cancellations and alterations. While every effort will be made to maintain the advertised service and traction, we reserve the right to alter or suspend our services without notice due to mechanical failure of other circumstance beyond our reasonable control. For full Terms and Conditions of Travel please click below. If you have an issue with any of our services or goods, please contact us either through the online contact form, or by telephone on 01263 733858. Complaints received by email will be acknowledged within 5 working days. Our Company Registration number is 02589211, Registered in Cardiff. Our VAT Registration number is 5950 545 19. We aim to provide the best possible service to all our customers. We have set up our website to clearly state which items we have in stock or tickets available at any point in time, so once your order is placed and payment confirmed, (immediately in the case of debit/credit cards and usually five working days in the case of cheques for mail orders), we are able to post your goods or tickets to you on the same, or next available, working day. Every product we send out is carefully and securely packaged to ensure your items reach you in the best possible condition. 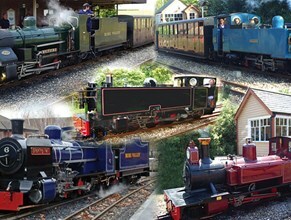 We hope you'll find what you're looking for on our website or in our shop on Aylsham Station the terminus of the Bure Valley Railway. We aim to offer a friendly and helpful service and offer competitive prices. Buffer Stop Books and Aylsham Friends Shop are wholly independent of Bure Valley Railway (1991) Limited and any queries relating to transactions with either of these shops should be directed to the appropriate shop rather than the Bure Valley Railway.